There’s something about the flavour of a melon that just says ‘summer'. Even in the depths of winter a chunk of ripe melon can remind you of what you can look forward to in just a few months. You’ll see a fair range of melons in supermarkets but they only form a small proportion of those available - around 35 varieties are cultivated on a commercial basis worldwide. You’ll be familiar with cantaloupe, honeydew, galia, ogen and charentais melons, but what about the Persian or horned Christmas melon? But first let’s go back a bit. Archaeological evidence suggests that melons were grown in Egypt about 2,400 years before Christ. But they weren’t the yummy fruits that we think of now. It’s more likely, judging by writings of the time, that they were more cucumber-like and far less pleasant. Cross-breeding, whether accidental or human-aided, changed this and over time melons developed their own distinctive flavour. They quickly spread all over the world, being recorded for the first time in England in the sixteenth century. Spanish explorers took them to the West Indies and America, and they soon grew in popularity. Now they are one of our most popular fruits. Melons are in the same plant family as squashes, cucumbers and pumpkins. Melons themselves are either watermelons or muskmelons (all the ones mentioned above and any melon that isn’t a watermelon!) and then muskmelons are divided into smooth-skinned and netted. Melons plants are annual trailing vines, which need careful treatment if you’re to grow them at home, but which will repay your attention with marvellous fragrant fruits. over-watering – the fruit may split. A melon is ready for harvesting when it’s a good size. It should also be heavy for its size. A ripe and ready melon will come off the stem easily. Look for a melon that doesn’t have bruises or cracks. Most importantly, smell it: a ripe melon should have a strong sweet fragrance. If under-ripe but mature it can be kept at room temperature for a few days to ripen. Once cut, keep it, well-wrapped, in the fridge for up to 3 days. Their perfume will affect other food in your fridge if they’re not well-wrapped. Wash the skin and dry thoroughly. If you’re in the garden or in casual mood, simply cut into slices and nibble away at it, ignoring the dribbling juice! For dinner parties, halve a ripe melon and remove the seeds. Scoop out balls using a small vegetable scoop or teaspoon. Chill while you make a lemon sauce. Place 2 teaspoons lemon zest and the juice of 2 lemons into a small saucepan. Add a little water if needed to make up to ¼ pint. Add 2 tablespoons caster sugar and bring to the boil. Simmer for 5 minutes. Scrape any remaining bits of melon or juice from the empty skins into the saucepan and then put it all into a blender and whizz for a few seconds. Taste and add more sugar if liked. Chill. Divide the melon balls between serving dishes and pour the sauce over. Serve garnished with a slice of lemon and a sprig of mint. Fact 1. Watermelon is 95% water. Fact 2. Melons are a good source of vitamin C.
Fact 3. Orange-fleshed varieties have lots of beta-carotene, an anti-oxidant that can do the same work as vitamin A. Fact 4. Melons are bisexual. Fact 5. You can buy square melons in Japan. 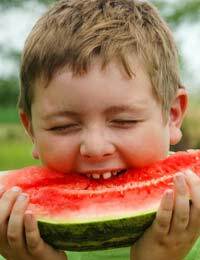 Fact 6.Melons are fat and cholesterol free..